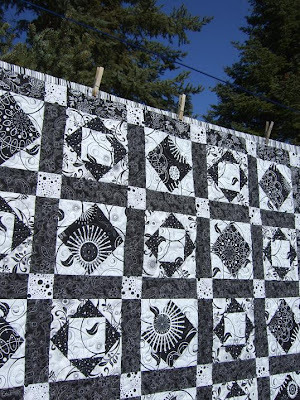 I quilted my Urban Nine Patch quilt today. I was having some trouble decided on how to quilt this one as I wanted to keep it gender neutral but once I got over the idea that "feathers are feminine" I just had fun with it! 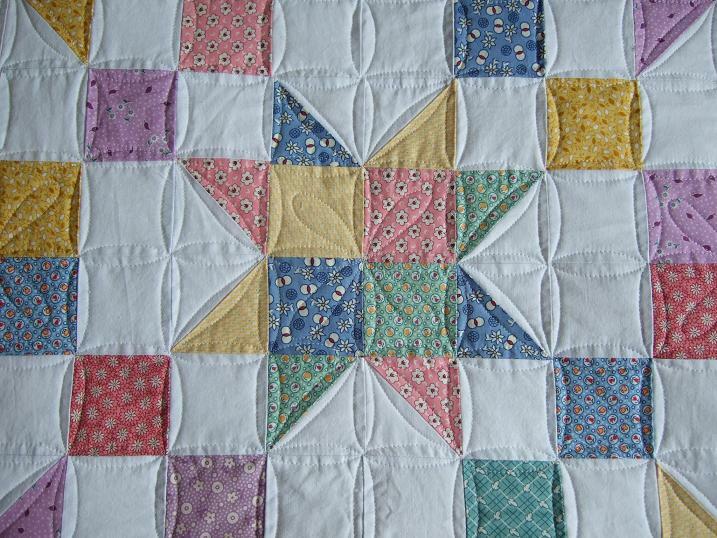 I SID around all the piecing and wanted the yellow rings to pop. 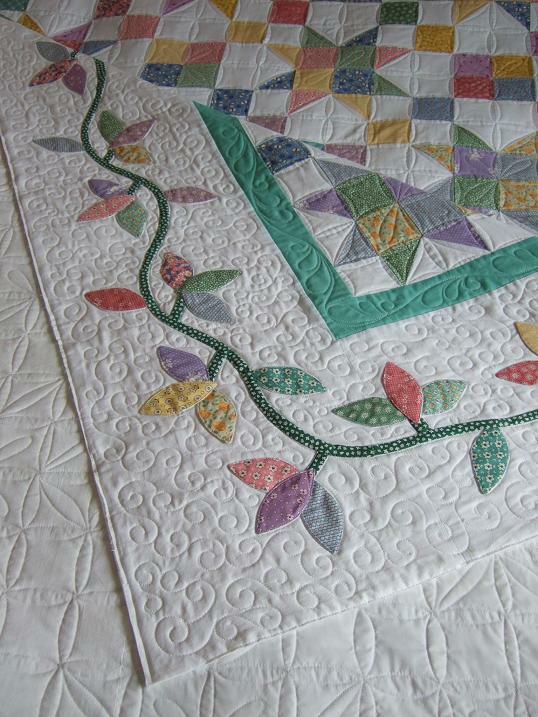 I did a mix of straight line quilting, CC's, feathers and fern feathers in the outer border. 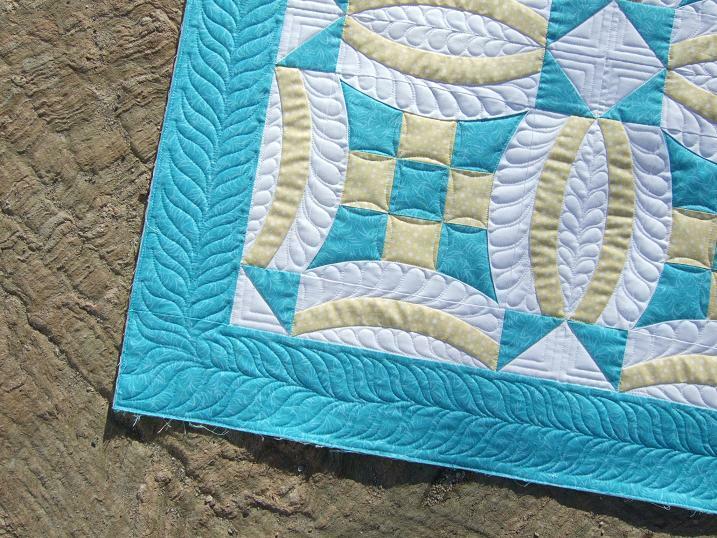 Love how the back looks on this too. 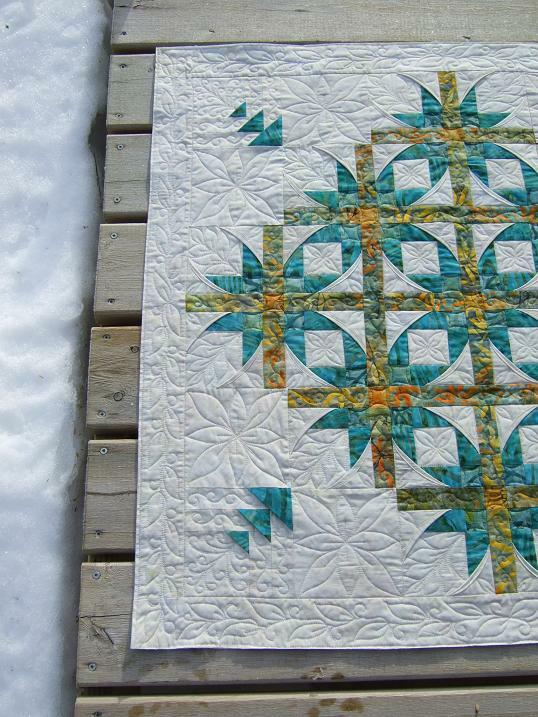 I hope to get the binding on in the next couple of days. 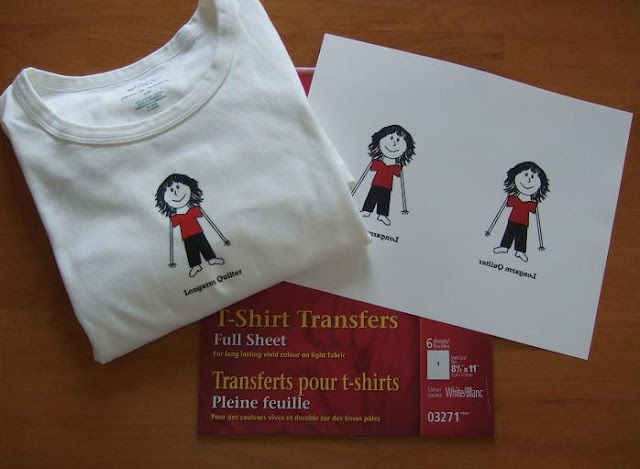 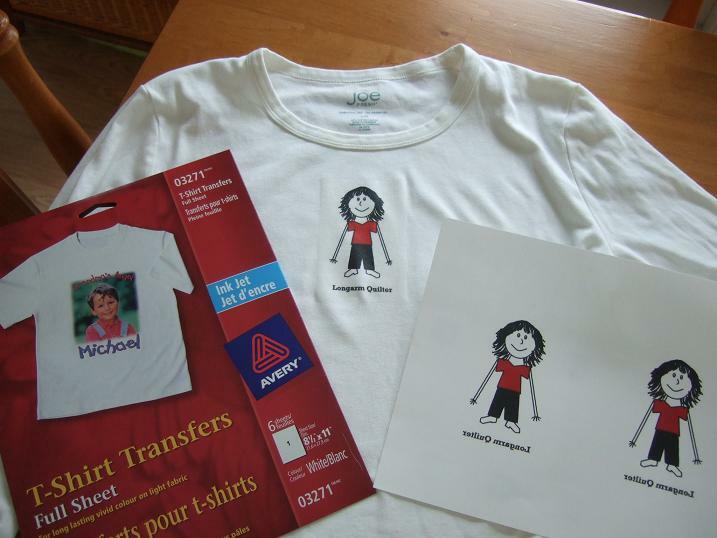 I have been wanting to make a T-shirt with this idea on it for a long time and when I bought a pack of T-shirts transfers to make shirts with my son (great Spring Break activity) and I thought this was the perfect time to give it a try. 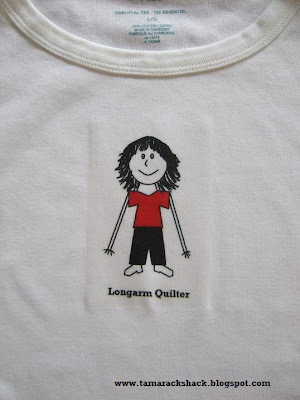 So last night I created this little longarmer using my Paint program. 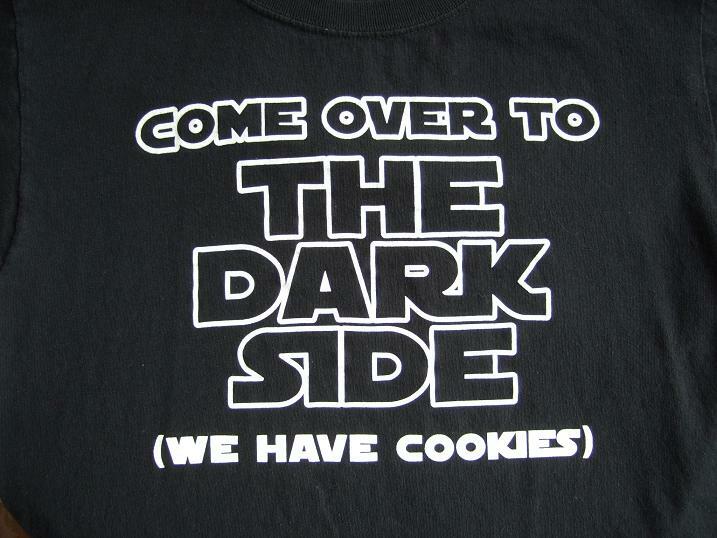 I know this is an old joke but it still makes me smile. I wanted to create my own version as I have seen this done a few different ways. 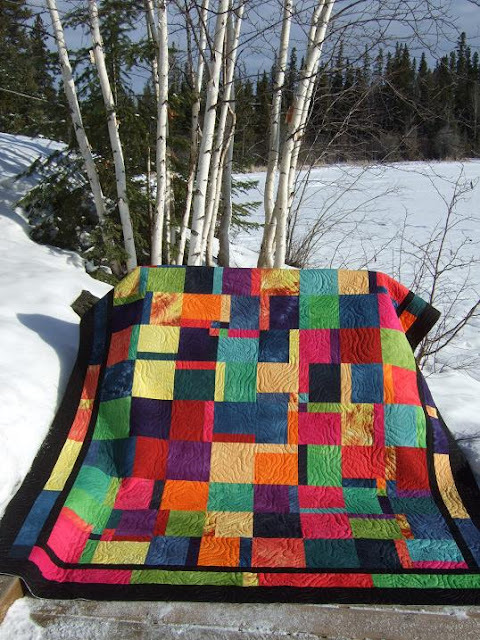 This is Jean's 30's Reproduction Quilt that she made for one of the beds at her place at the lake. 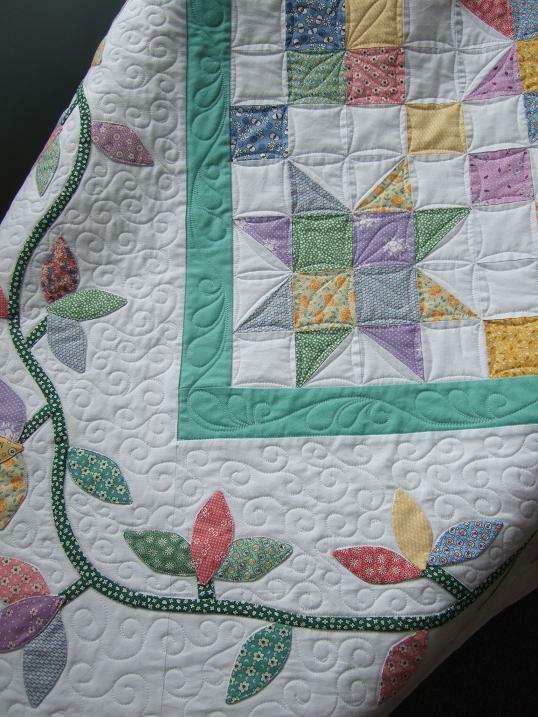 This was her first time appliqueing a quilt and she did a wonderful job. 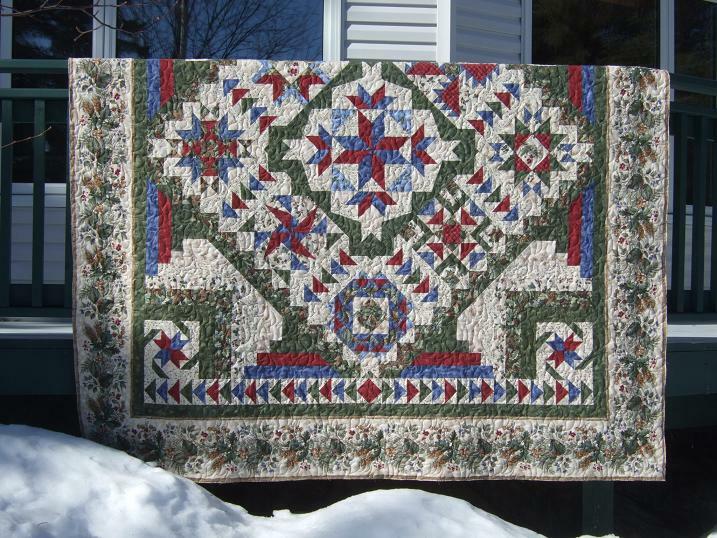 She purchased the Reproduction fabrics while on a trip in the States. I just CC'd the squares in the body of the quilt and added petals in the center of the stars and four patches. I wanted to keep the traditional feel of this quilt as it would have probably been hand quilted 1/4" in from all the seams in the 30's. This is the largest quilt I have had on my machine so far...107" x114". 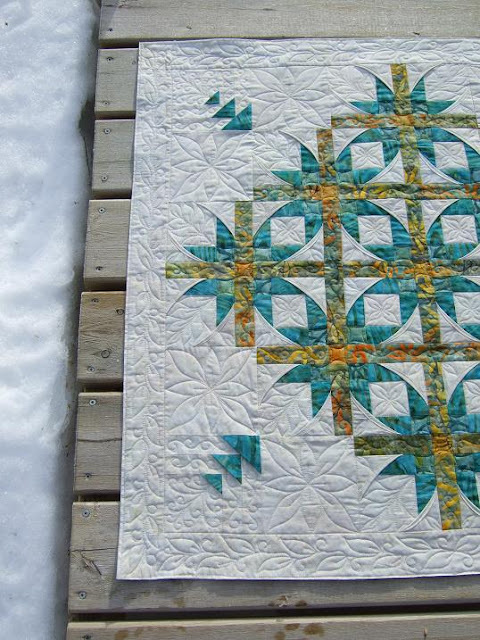 I did my favorite 'feather feather curl' inner border design that I learnt from Carla Barrett's Quilt Whisperer class. I then SID around the applique in the border and added a curl background fill. 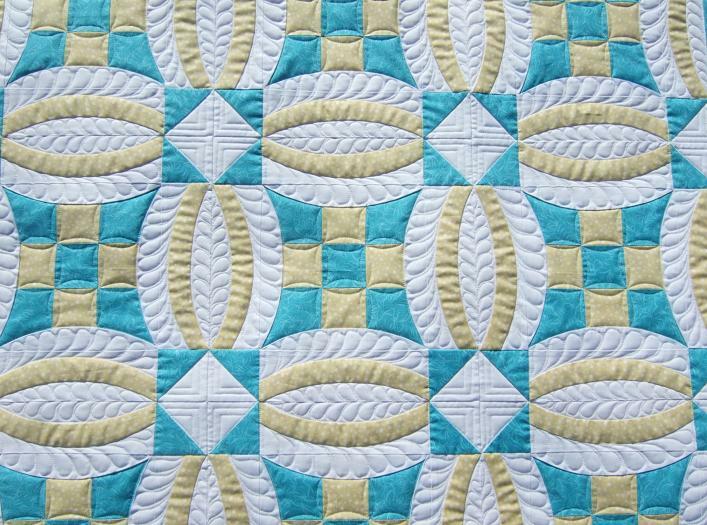 The backing fabric is solid white so shows off the quilting nicely! So here are the results of yesterdays snow dyeing. I used Slate on one fabric and Slate and Orange on the second fabric. 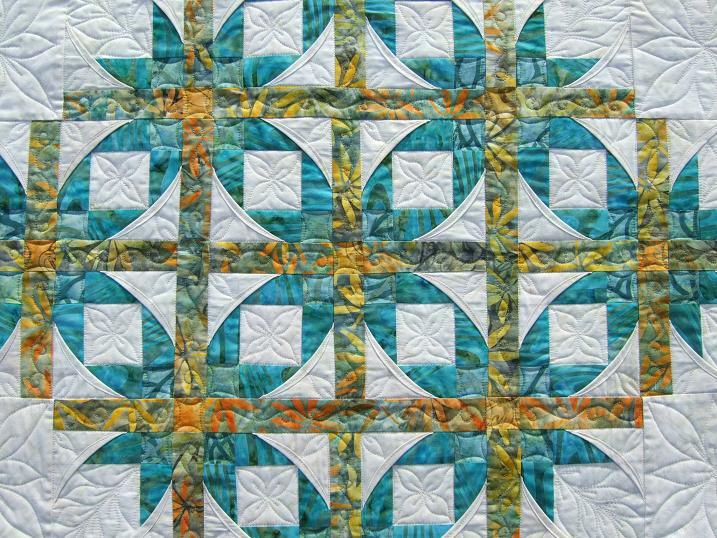 Lori said she has been having great results with Slate and orange so I though I would give it a try too. 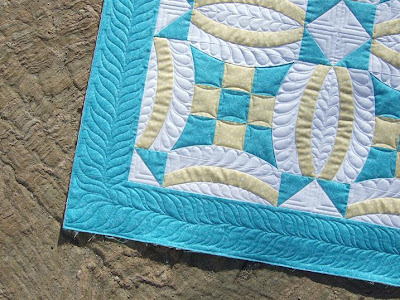 I really like how the orange blended with the blue and think I will try this again with less orange. 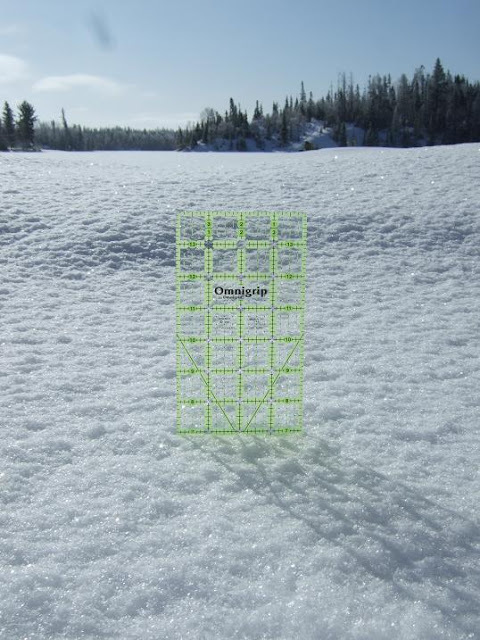 And here is the 'official' snow measurement for the last few days. If you can't read the ruler it says 7". ...it has been snowing non-stop for the last two days and still snowing!! 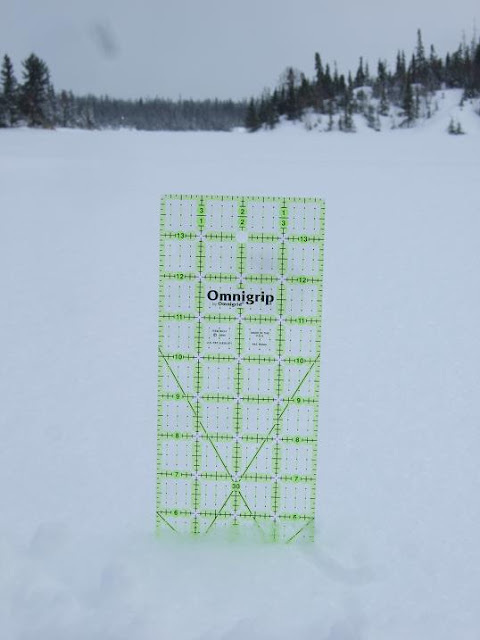 I placed this ruler on the spot where I cleared the rink for the quilt in my last post. 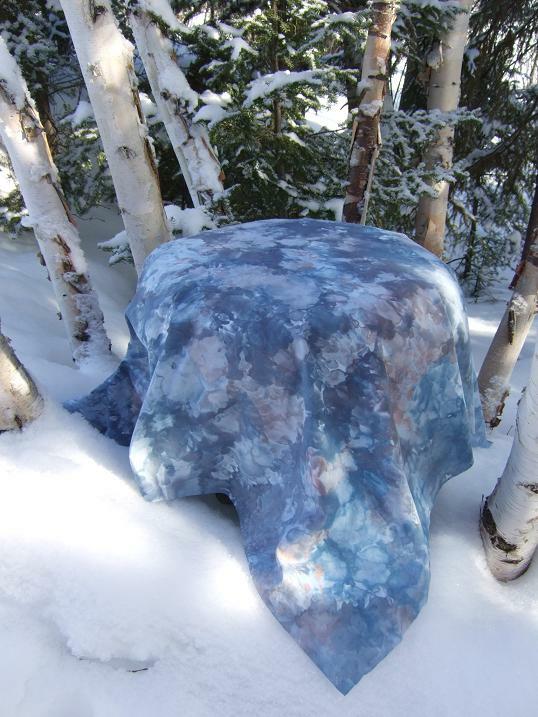 And yes I am snow dyeing right now...as much as I am done with the snow it is perfect snow dyeing snow! 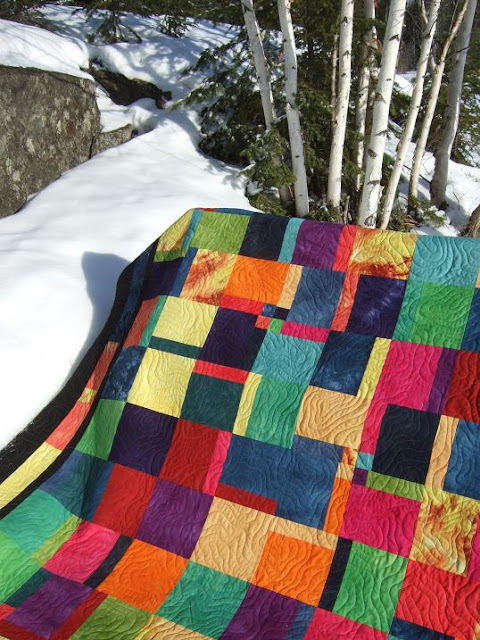 Here is Robins Hand Dyed quilt using the pattern Turning Twenty. 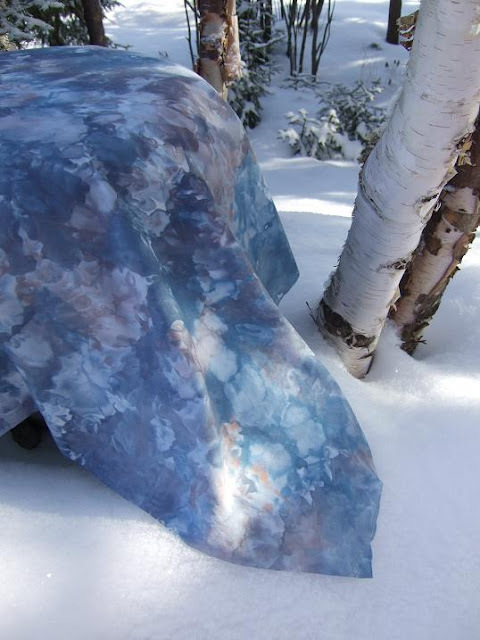 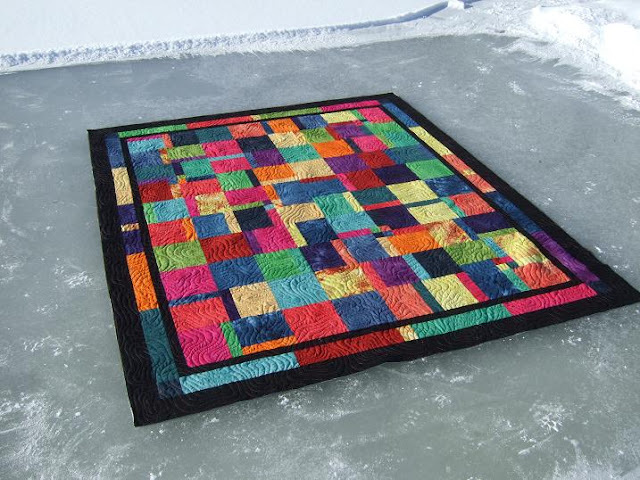 She enjoys dyeing fabrics and snow dyeing like I do and was able to cut into her hand dyed stash to make this quilt. 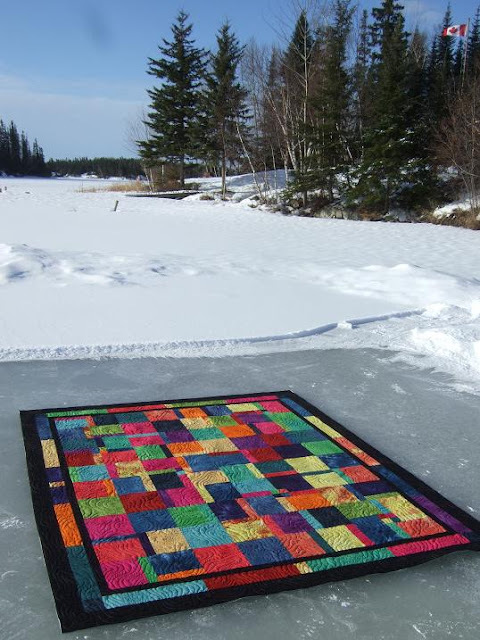 We had a few inches of snow fall the other day and today it as -10'c so I had to get the shovel to clear the ice rink. For the last two weeks I kept thinking (hoping) this would be the last time I get to do this but no such luck...it keeps snowing and is still below freezing. 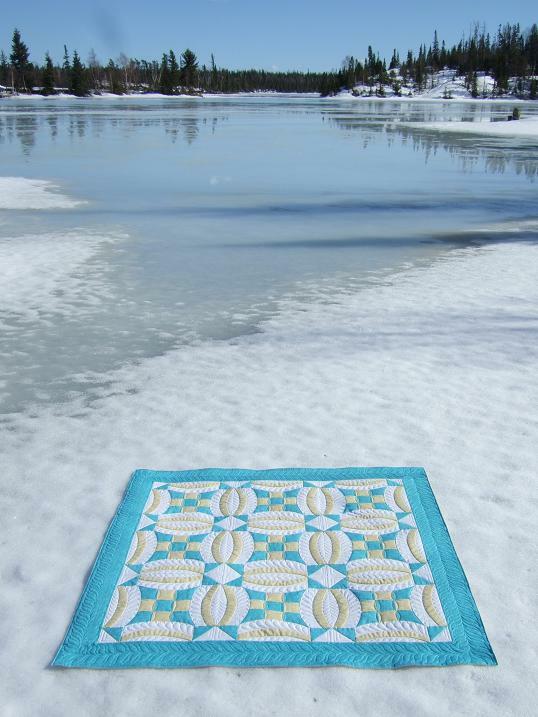 I know some of you like the snow pictures but I am ready to see the lake again! 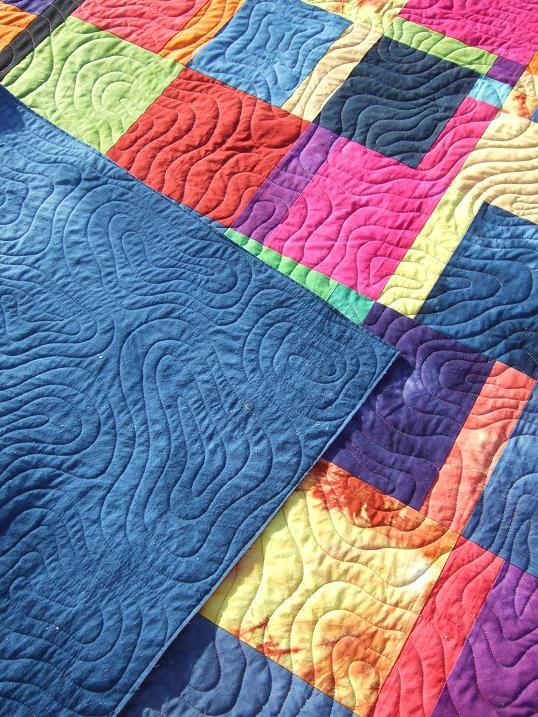 I did free hand Topo quilting design with a very bright multicolored Lava thread. 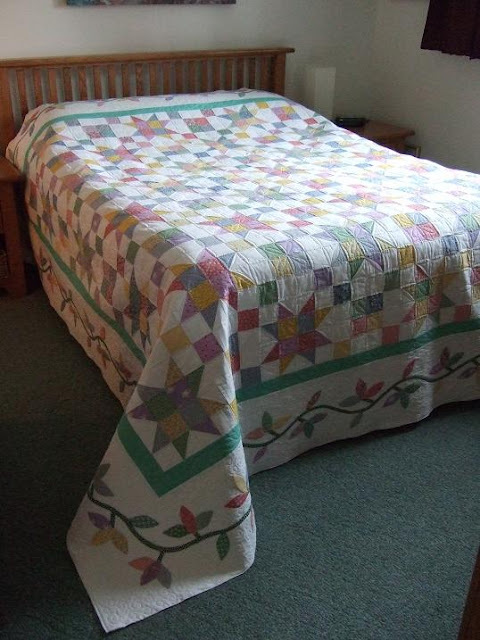 I did have some trouble with thread breakage on this quilt but I am positive it was the hand dyed fabrics causing this as we both use the same poplin cotton for dyeing and it has a high thread count. 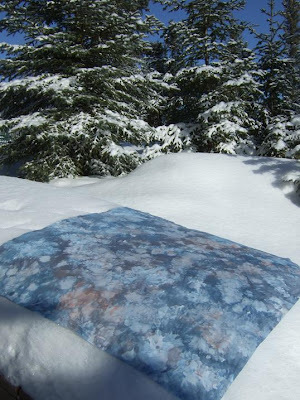 I think the Lava is too thick of a thread to use with our hand dyed fabrics. 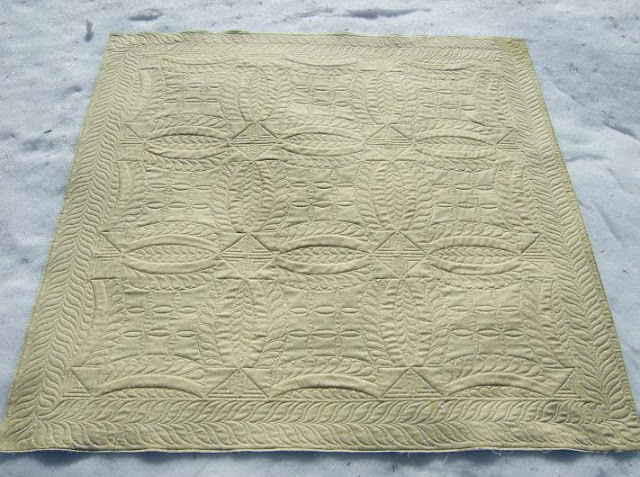 The backing was dyed too. 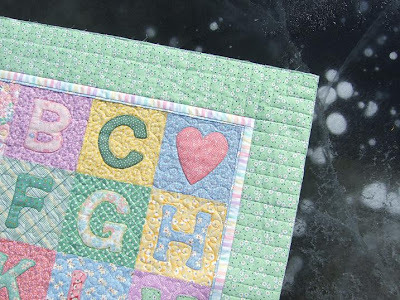 You can see the thread color in this picture. You can also see all the little pea size hail frozen in the ice from our thunderstorm on Sunday. 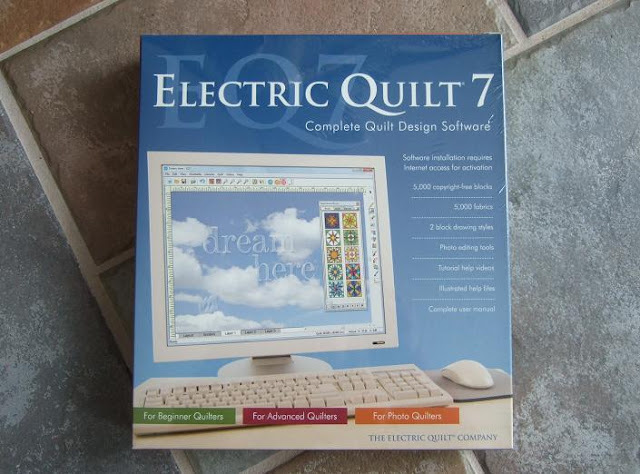 Okay time to take that plastic wrap off my EQ 7...if I don't post for awhile you'll know why! 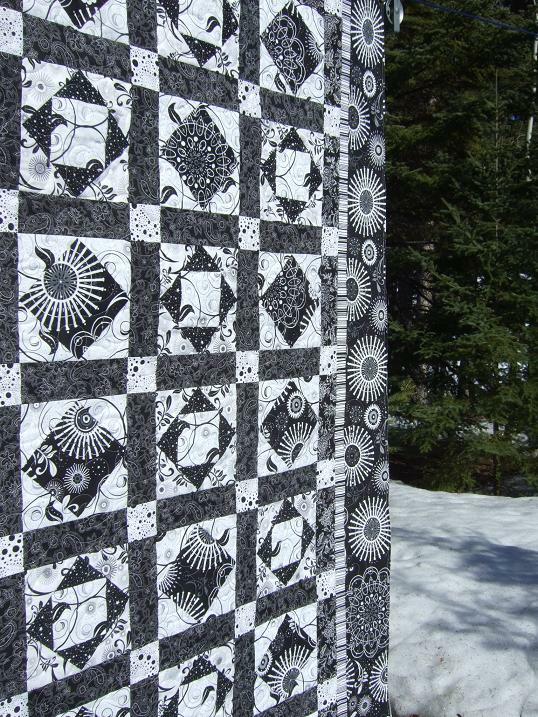 This is Marg's Black and White quilt made with the Califon fabric collection. 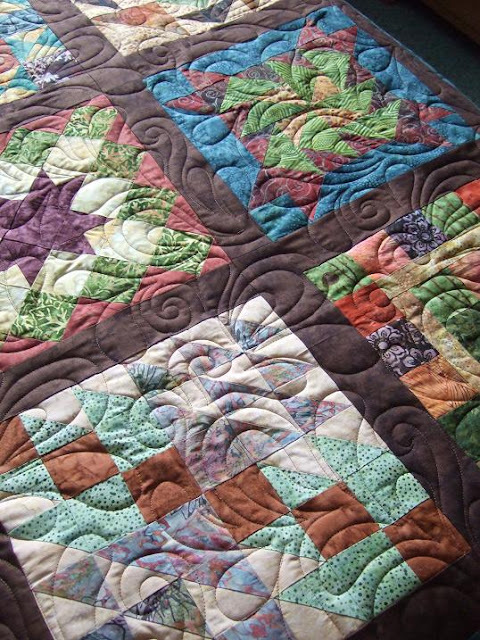 I quilted it with the Popcorn panto and you'll just have to trust me on that one as I know you can't see the quilting in the pictures. 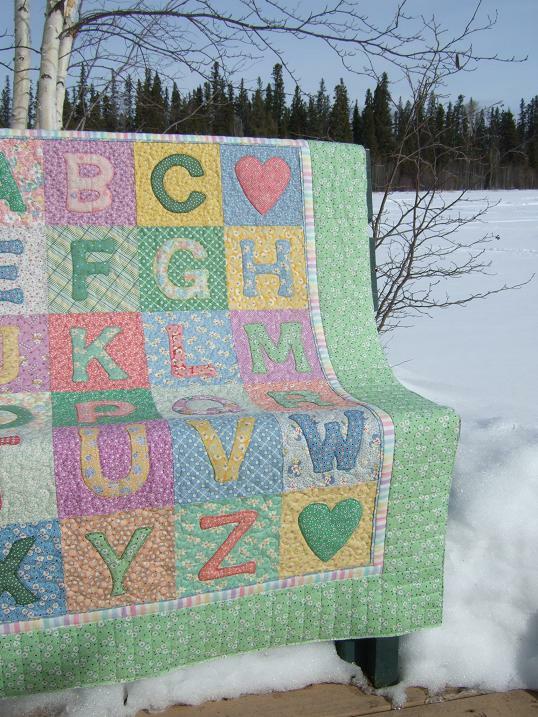 Yes it's not that hard to figure out ...I'm sure the spruce needles give it away! 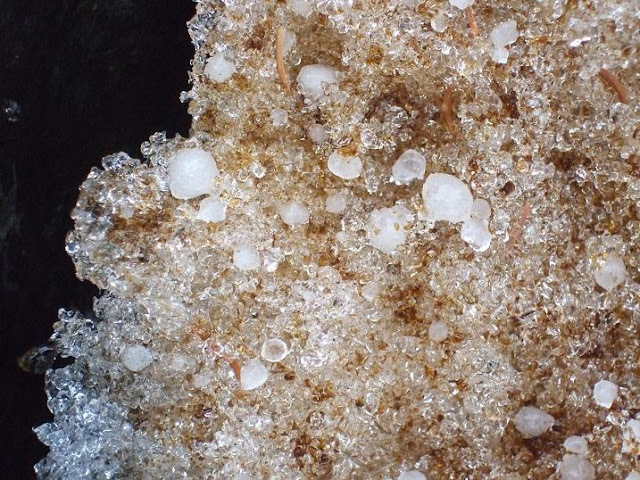 We had a winter thunderstorm yesterday along with hail! 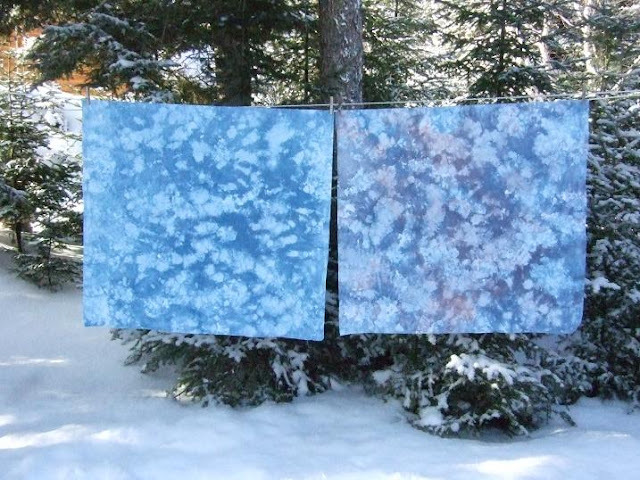 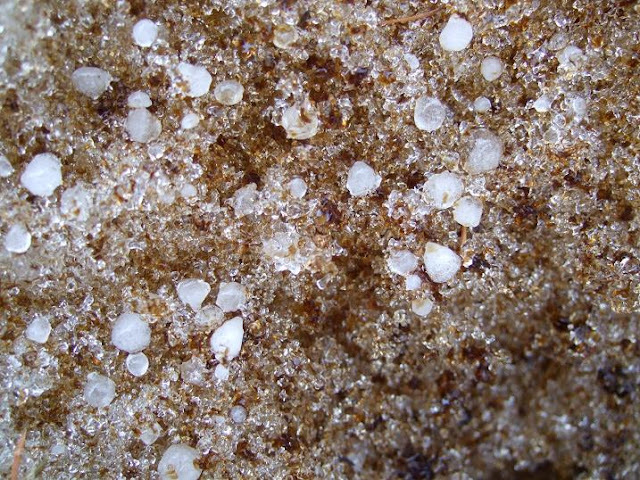 Very strange but made for some interesting photos when I poured a very diluted brown and grey dye on the snow. 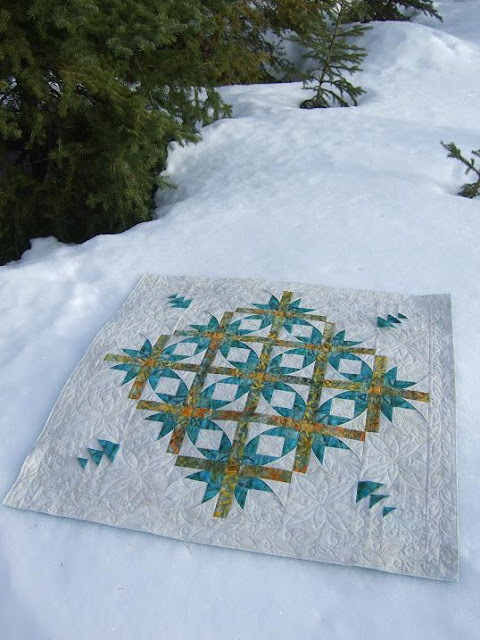 It turned the snow silver and gold! 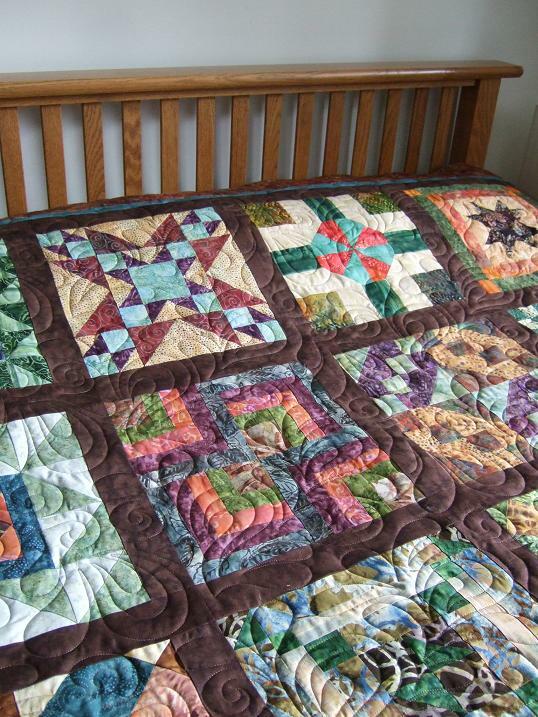 This is another one of Marg's quilts. 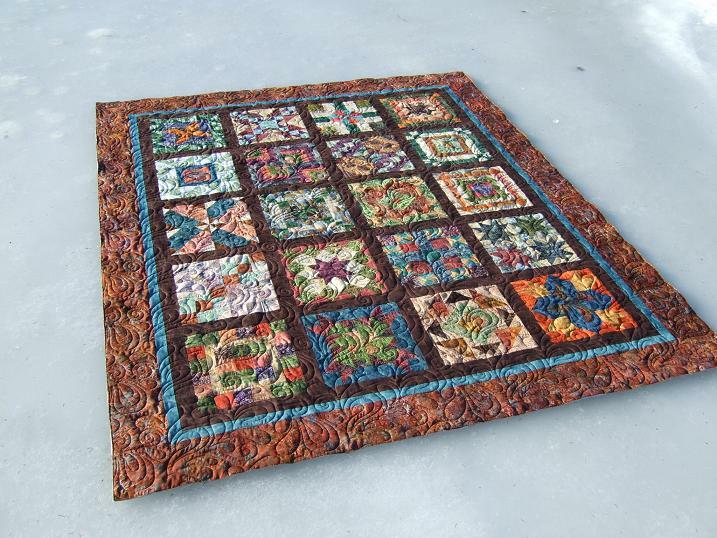 This one is called Surprise Sampler and was a Block of the Month from Periwinkles in Saskatoon. This was Marg's first quilt using batiks and she was quite pleased with how they were to sew with. She asked for my Quilters Dream Wool and I used a brown Lava thread. 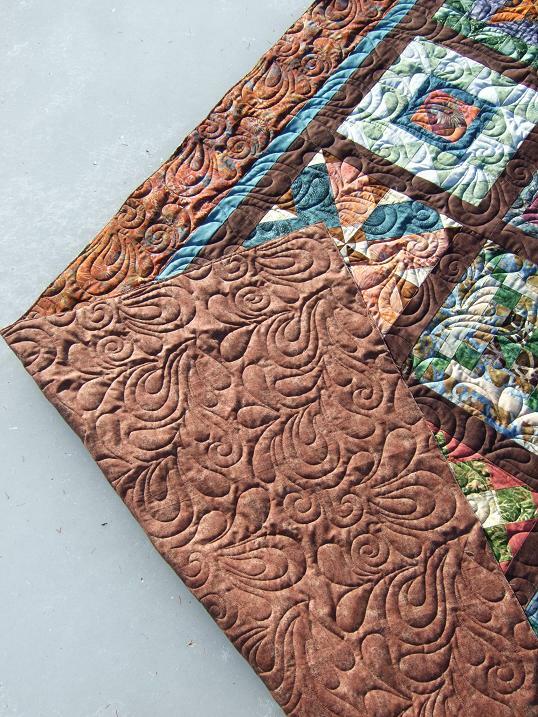 The backing was a nice tone on tone brown to show off the quilting. I got up early to take these pictures so that I could use the ice before it turned into a large puddle like it has been all week during the daytime. 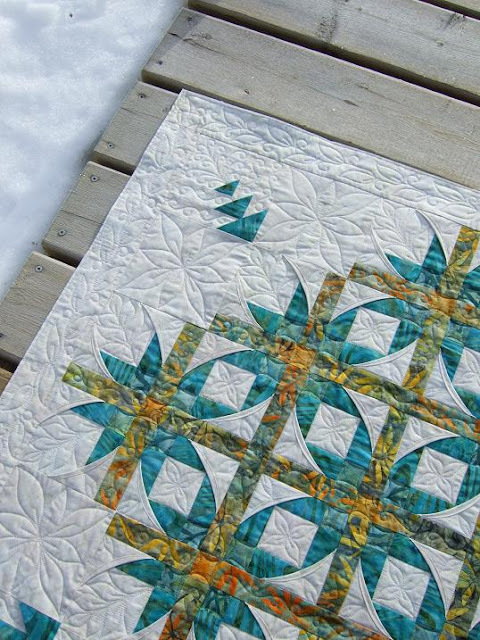 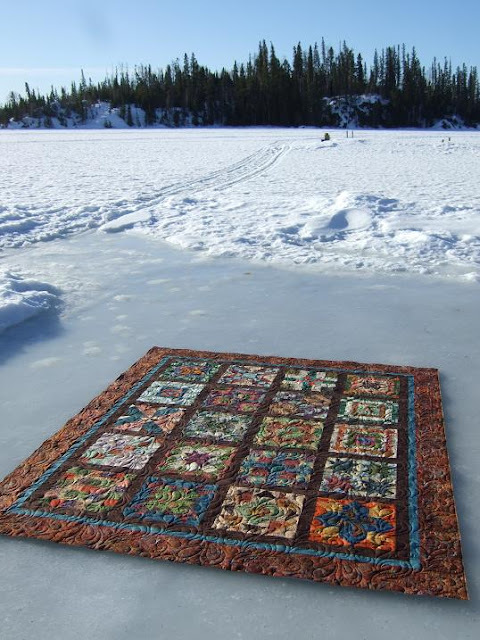 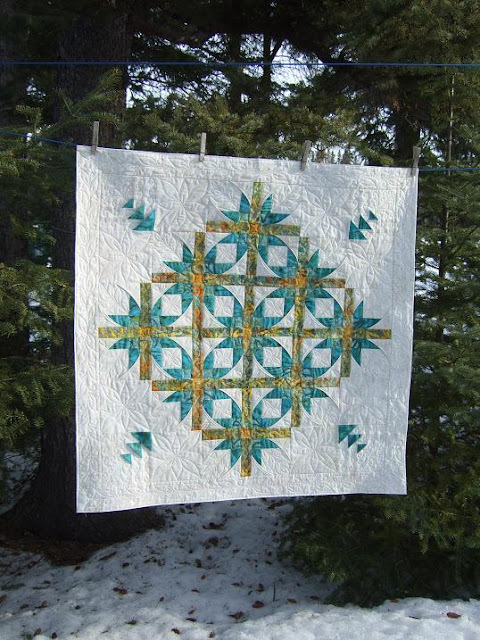 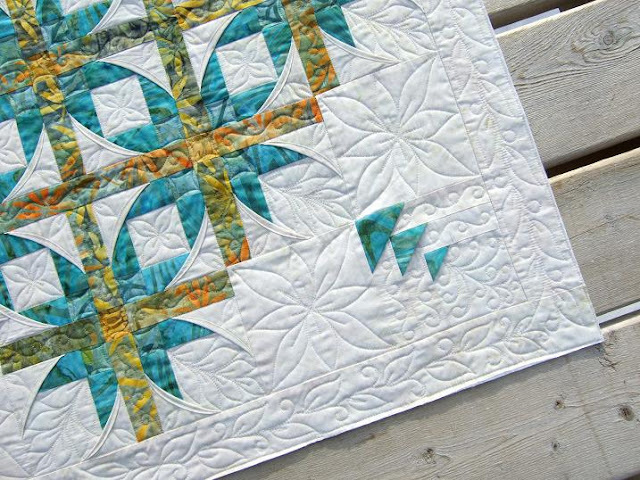 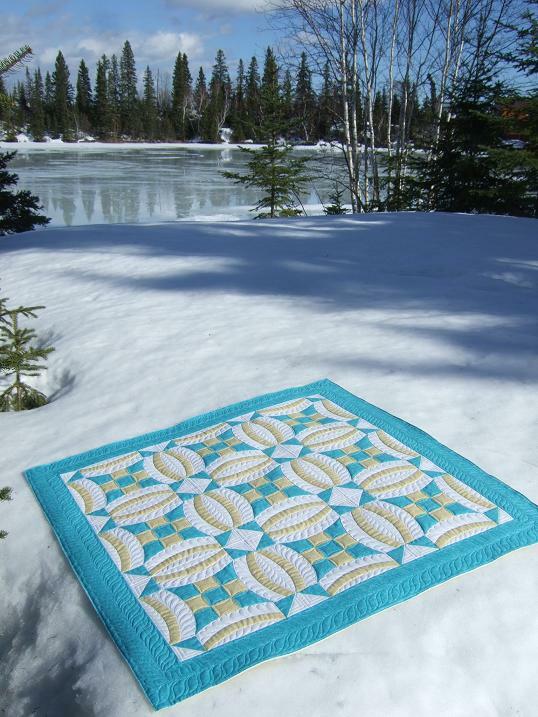 This is Marg's Back to Nature quilt, a 2010 Block of the month pattern by Wing and a Prayer Designs. She asked for Dream Wool batting and chose Ground Cover for the panto design. 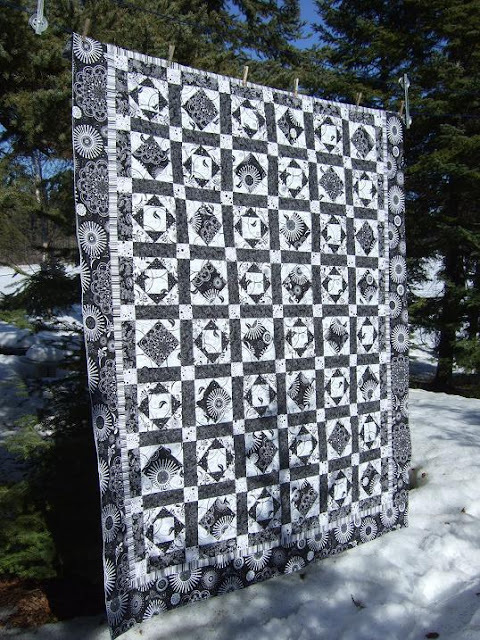 When I was taking the photo of the quilt on my deck railing I had to walk through knee deep snow. The top layer of the snow is icy from melting during the warm days and as a kid sometimes I was able to walk on top of this kind of snow but I can't anymore! 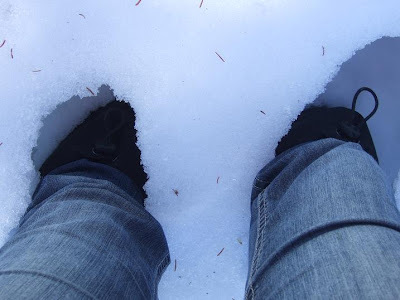 That was always fun as you never knew with each step if you would stay on top or drop through that top snow crust and get a boot full of snow....like I did taking these pictures! 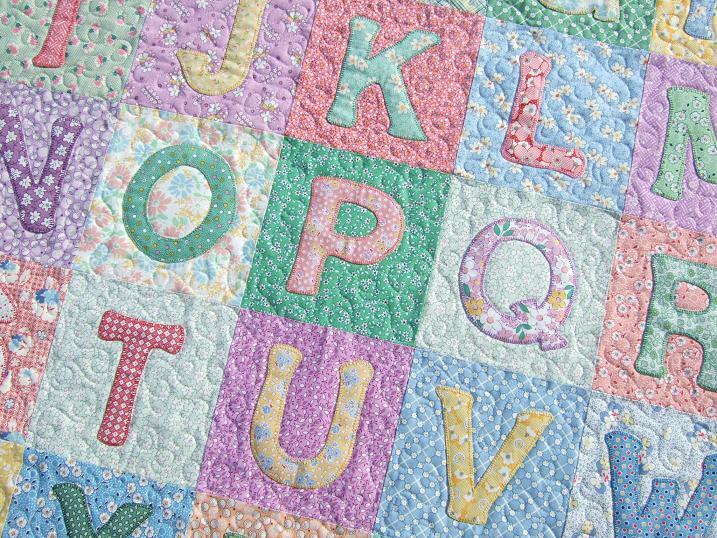 This is Rae's Alphabet quilt and she appliqued all the letters by hand with a blanket stitch. 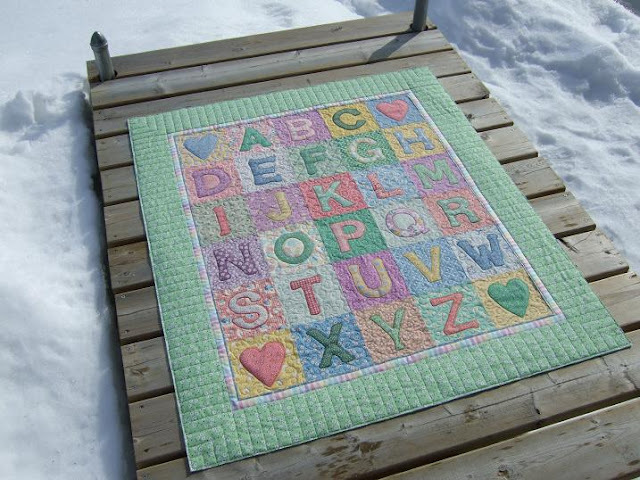 She used a great collection of vintage fabrics for this quilt making it perfect for a baby. I quilted tiny loops in the background and SID around the letters. 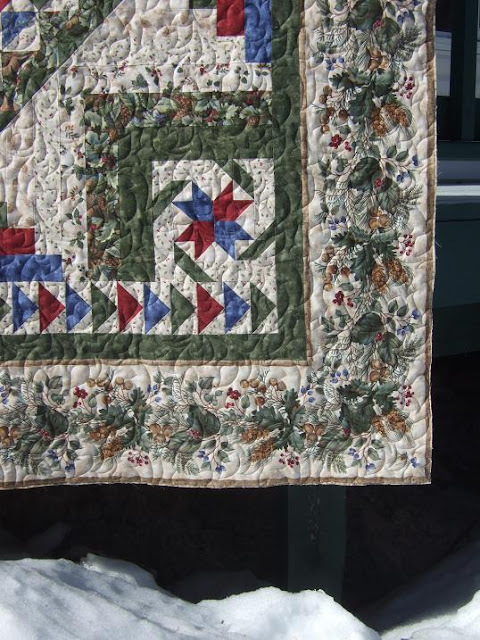 Then quilted piano keys in the outer border. You can see all the white air bubbles frozen in the ice. 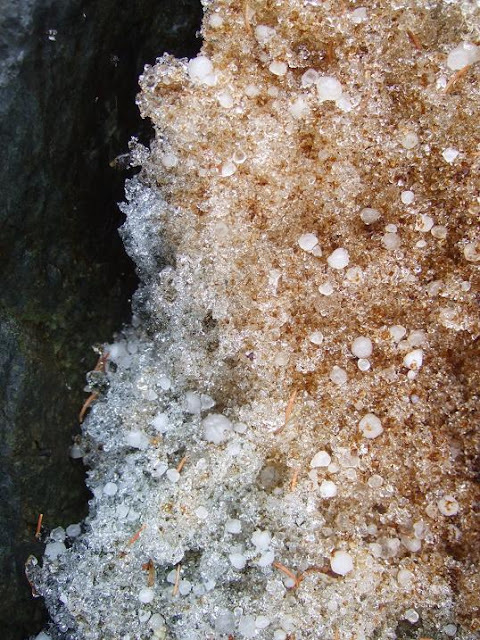 I took this picture a few days ago and the ice is now all cracked and cloudy from our warmer temperatures. 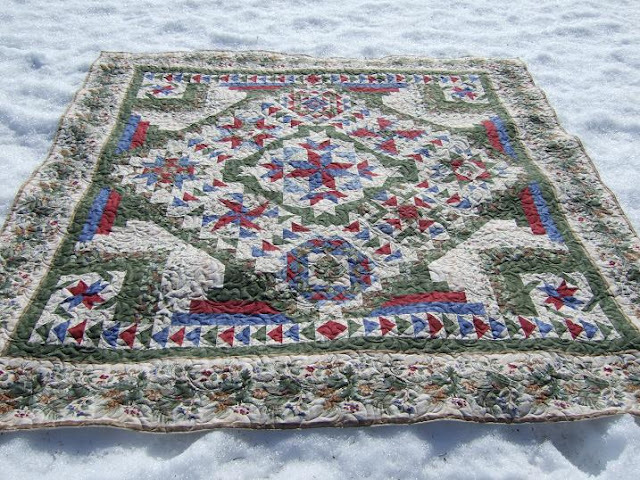 This is Lynn Mexican Star quilt. 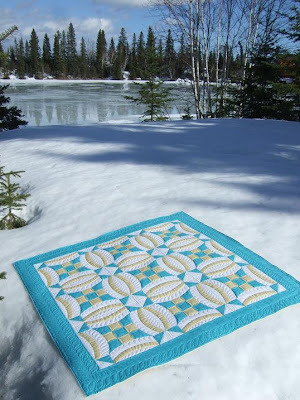 I just love this pattern and have made it for myself, you can see mine here. 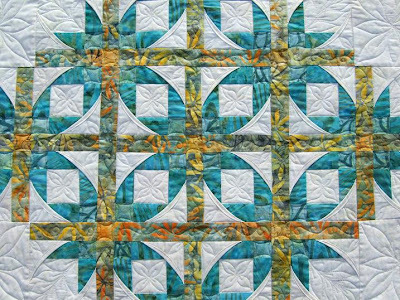 I was doing a lot of 'Sit and Stare' with this one so I showed it to Desley and she suggested quilting leaf designs as the batik fabrics have a leaf print. So with that idea to get me going I quilted free hand leaf motifs in the different pieced areas of the background fabric. 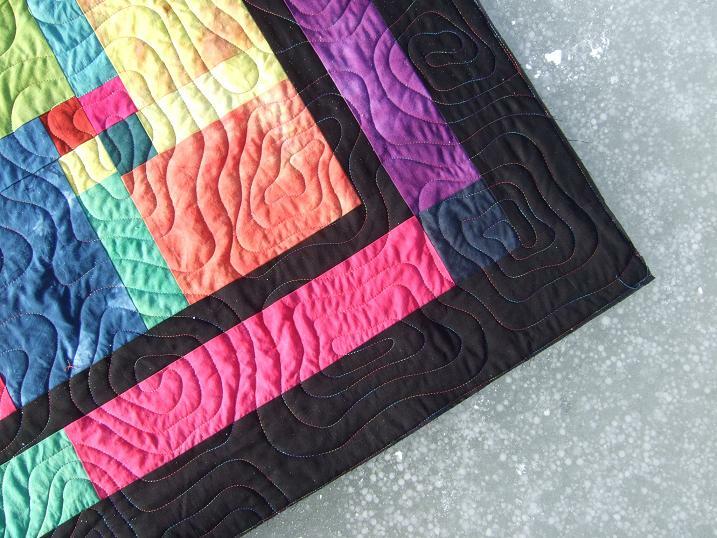 I think the key to quilting this one is to keep the quilting density even so it will lay flat as it is a wall hanging. I was tempted to do small dense background fill but very glad I didn't. 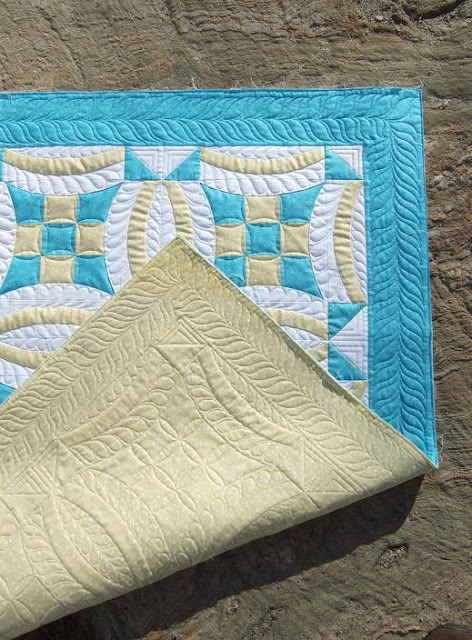 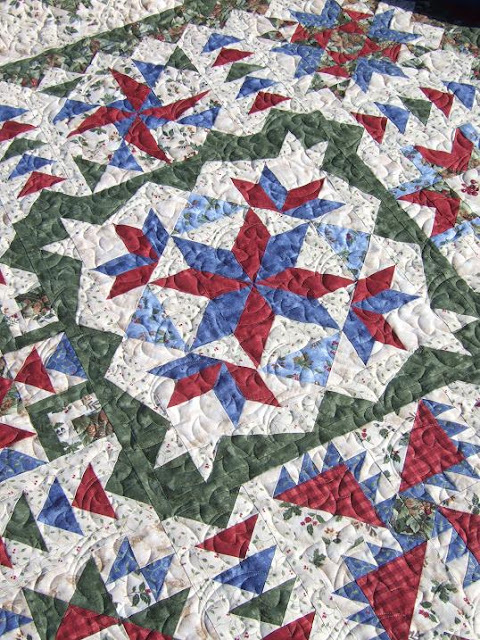 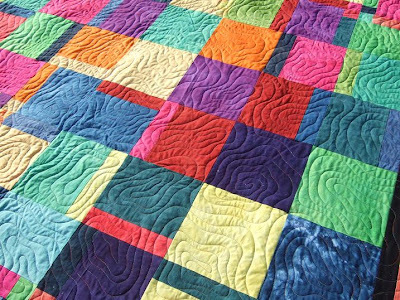 If you have come across my blog post looking for Mexican Star quilting ideas then I will direct you to a post on a friends blog that has what I think is the best quilting I have ever seen on his pattern ....click here! 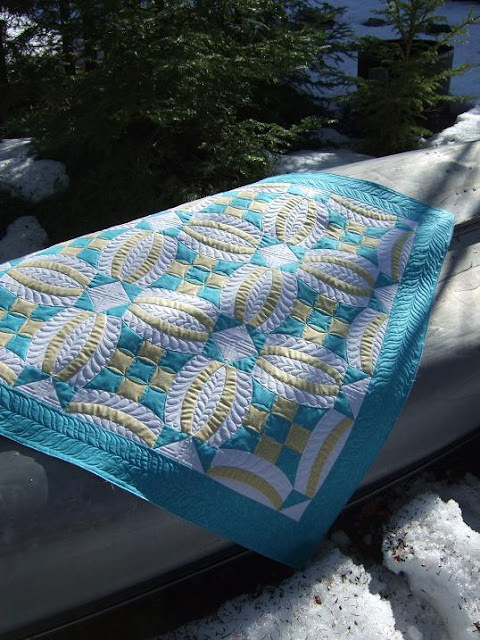 Giveaway at Sew Kind of Wonderful! !